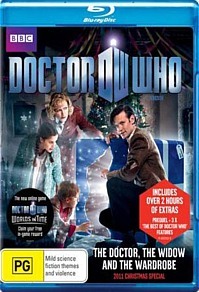 Doctor Who - The Doctor, The Widow and the Wardrobe Blu-ray Review. It’s all very American and not welcome. It’s great that Doctor Who has American fans who don’t know what a Drashing is, but that’s not for me. Last years’ Doctor Who Christmas Special was a take-off of the classic Charles Dickens tale, “A Christmas Carol” albeit an almost unrecognizable sci-fi one. This year they decided to do something different and take on C.S. Lewis’s Christian allegory “The Lion the Wich and the Wardrobe.” Sort of. There was much promise with this episode, after all it has Bill Bailey in it and he’s great! The Doctor is escaping from an exploding space-ship that is on the way to invade the Earth. He puts on a spacesuit but he is in such a hurry he puts it on backwards. On Earth it is just before WWII and a nice lady helps the Doctor back to his Tardis. Favors bestowed on the Doctor are not forgotten so when the lady loses her husband in the war and can’t tell her children the Doctor intervenes to give them the best Christmas ever. Let’s be frank, the first half is brilliant. The Doctor putting on a spacesuit backwards should be ridiculous but somehow it’s just fun. The Widow helping him should be silly but once again it’s fun. His intervention into their lives has potential and it does work. The second half where they go through the gateway to a forest of living Christmas trees fails on almost every level. Bill Bailey is great as are his co-stars but is criminally underused. And much like The Lion the Witch and the Wardrobe, when they go into the forest I was expecting high adventure but this limps along. It would be too easy to make a joke about it being wooden but all the actors acquit themselves well. The script fails to deliver action, adventure and falls back on the “Love conquers all” nonsense that makes this more of a fantasy show than a sci-fi show. Video: Video quality is great especially on the Blu-ray. The BBC have really gotten the hang of this high-definition thing. Audio: I always like Doctor Who in 5.1 I think it really adds to the experience. There are no less than 3x45 minute features all commissioned by BBC America. Self congratulation in abundance as B list celebrity and fans of Doctor Who come out of the woodwork to celebrate Matt Smith. (As if his strangely shaped head needed to be any bigger.) Don’t get me wrong, I like Matt Smith, sort of. But this kind of thing is unnecessary and annoying. As is the constant recapping of what Doctor Who is all about, I KNOW what the Tardis is; I’ve only been watching it for about 30 years now. It’s all very American and not welcome. It’s great that Doctor Who has American fans who don’t know what a Drashing is, but that’s not for me.